To register for an upcoming session, please refer to our schedule and the pricing information below. Complete the registration form for each skater and session you wish to register. After submitting your form, please use the payment link to send the appropriate payment total and complete your registration. For more information or questions, registration and payment deadlines, and class times, please contact us at (716) 636-7401 prior to completing your registration. 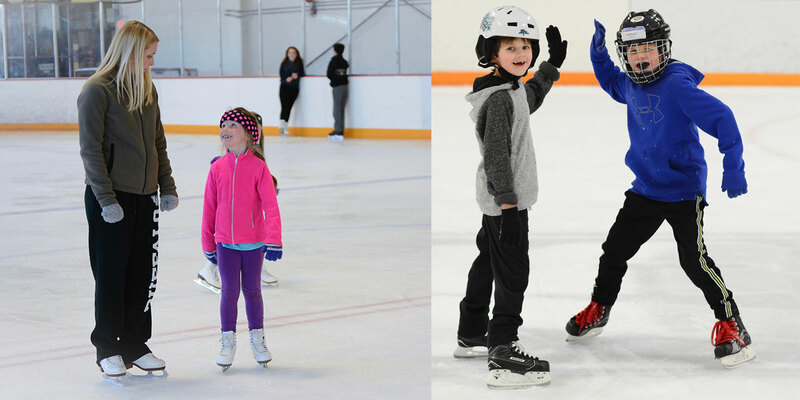 Beginner skaters must wear a bicycle or hockey helmet and winter gloves. There is no skate rental available. It is recommended that figure skaters use single blade figure skates (with a toe pick at the front of the blades) for this program. No refund once each session starts and only one make up per session, which must be made up during this session. Spring (April 1 – June 14, 2019) – 10 weeks – no skating April 22 – 26. Spring: Mon. 5:15-5:45pm (NU), Wed. 6:00-6:30pm (NU), Fri. 4:55-5:25pm (NU) – no Skating April 22 – 26th. Are you interested in more information about private lessons? It is understood that Niagara University, Mitchell’s Skating Center, Inc., the Professional staff or any assistants shall not be responsible for any accidents or loss of personal property on or off the ice and the right of recovery is hereby waived and I give permission to use photographs of myself/my child on Mitchell Skating Center’s web site. Please enter your name below to serve as a signature. Upon submitting this form, your registration will be sent to us for processing. You must send payment to complete your registration. Please use the pay-on-line link above to send a secure payment by credit card. If you have any questions about payment or your registration, please contact us at (716) 636-7401.